A ruckman or key forward from Ballan who had a horror run with injuries at both Richmond and Collingwood. A mobile tall, Francis did not win enough of the ball in aerial or marking contests. Collingwood took a punt on him by drafting him after an injury riddled saga at Punt Road and were impressed by his enthusiasm to succeed and overcome his injury problems. 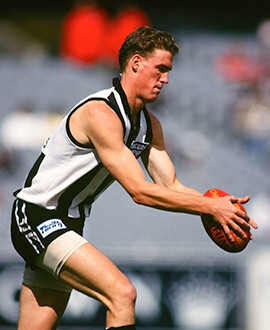 He performed well at different stages of his 36-game stint at Victoria Park, particularly in 1997 when he played 15 games and contributed as a third tall forward behind the Rocca brothers mid-way through the season. In retirement, Francis took up a position in coaching in Queensland.